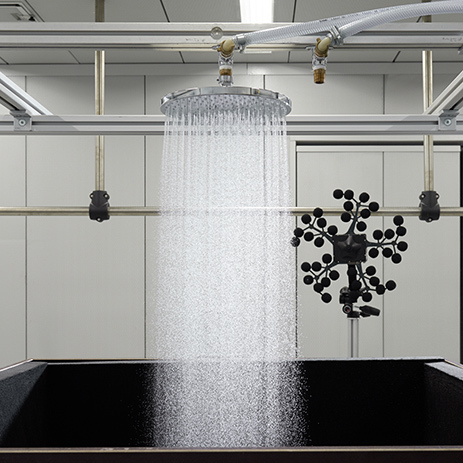 The experts at the Hansgrohe spray laboratory have developed PowderRain, which transforms the daily shower into a truly unique experience. A variety of hansgrohe Raindance Select S showers are equipped with this. 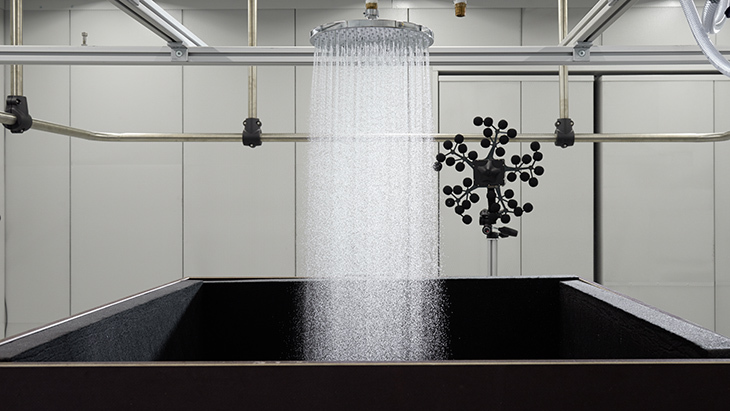 As a result, these round, modern showers, which are popular with customers all over the world, can now also create ultra-soft, micro-sized droplets. All thanks to a completely new technology. This innovative jet caresses and pampers the skin, enveloping the showerer in a cocoon of water. 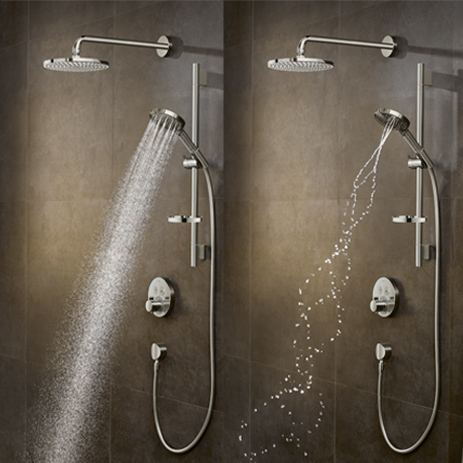 Your customers will love the soothing experience they get from these showers. They will find it wonderfully calming to submerge themselves, dream and relax in this gentle, quiet oasis of water. … features impressive micro-sized droplets. 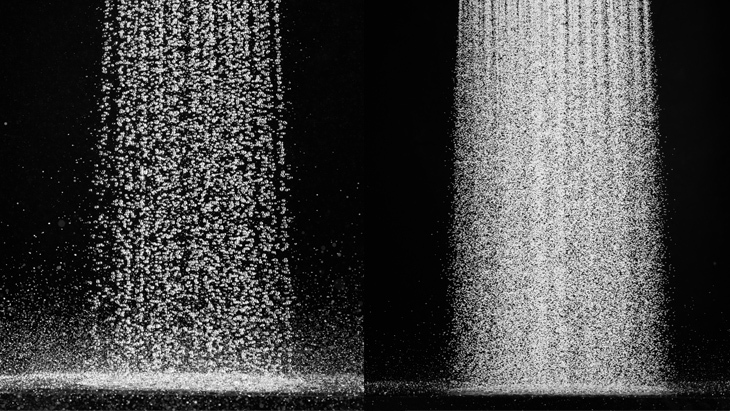 PowderRain is based on technology featuring micro-sized droplet jets. The individual jets have six fine apertures (instead of just one) which repeatedly divide up the jet. This makes it much more delicate than a conventional shower jet. Thousands of ultra-fine droplets envelop the body, over a large area. Since PowderRain splashes less, this also entails less cleaning in the shower area. This is particularly encouraging if you have an open-plan bathroom design or walk-in showers, which are very much the current trend. The gentle shower jet offers a unique, gently relaxing experience of water, because it is quiet. The experts at the hansgrohe sound laboratory have succeeded in reducing the shower noise to a mere whisper. So you can switch off completely during your daily body care routine. … enables you to wash your hair efficiently. The significant increase in the number of droplets means that the jet is gentle but also effective. It is ideal for washing out shower gel and shampoo. ... is economical and sustainable. Would you like your showering to be a natural experience, where you are doing something for the environment at the same time? No problem: with PowderRain, the water consumption has been reduced. This means you can save up to 20 percent of water and energy when showering. PowderRain showers are also equipped with hansgrohe technologies, which will make your customers' lives more comfortable: these control the jet types via the Select button. QuickClean also helps you combat limescale. Quick replacement of the hand shower, the shower set and even the complete solution with the showerpipe. hansgrohe has added its new jet type to the Raindance Select S shower range – a modern, highly functional and reliable premium range which is popular all over the world. We are starting off with a wide range of products containing the perfect solution for every customer: ranging from the simple screwing on of a new hand shower through to the installation of a complete shower system with concealed control system. The fine jets are built into the Raindance Select S 120 3jet P hand shower. This shower also pampers you with the jet types Rain (lavish shower rain) and Whirl (soft massage spray). Combined with the matching wall bar, this makes up the Raindance Select S 120 3jet P shower set. 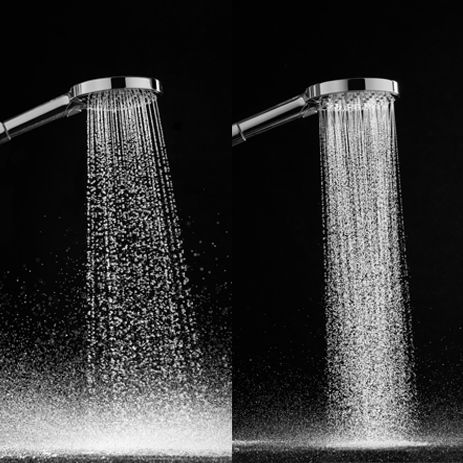 Once the Raindance S 240 1jet P overhead shower is installed, the micro-sized droplets bathe your whole body. A totally indulgent combination of overhead shower, hand shower (both with PowderRain) plus thermostatic mixer is available in the form of the: Raindance Select S 240 1jet P showerpipe.